As more countries focus on which tourists are spending what, expect tourst boards’ advertising to shift bigger chunks of their budget to Asia and the Middle East. Wearing two thick brown sweaters on top of her blue-and-gold sari, Sujatha Thoota from Hyderabad, India still shivers as she looks onto the largest glacier in the Alps. It is the first snow she has ever seen. “It’s wonderful,” said Thoota, on holiday with her family, but adds she is too scared to venture out onto the ice. View From Jungfraujoch, Switzerland. Photo by Edwin Lee. Attracted by the fresh air, snowcapped mountains and cleanliness, Asian and Middle Eastern visitors are flocking to Switzerland, helping to counter the impact of Europeans kept away by the strength of the Swiss franc and widespread belt-tightening. The Jungfraubahn cog railway line, considered pioneering for the steep incline of its 7-kilometre tunnel hewn into the Eiger and Moench mountains, is celebrating its 100th anniversary this year. The train’s history is emblematic of the evolution of Swiss tourism. A century ago, during the train’s first year of service, 39,000 travelers ascended to the Jungfrau’s observation deck, nearly 3,500 meters above sea level. Most of them were European, a spokesman for the railway said. In 2011, 60 percent of the 765,000 visitors to the site, a must-see in Switzerland for many tourists, were from Asia. Hoteliers and restaurateurs have complained about the impact of the soaring safe-haven franc, which has risen by nearly a third since the global financial crisis erupted in 2008, prompting the Swiss National Bank to set a cap of 1.20 per euro last September to stave off a recession. Yet there is a silver lining. Since the cap was imposed the franc has tracked the euro, and as the single currency suffered because of the euro zone debt crisis, the franc has fallen alongside it. That has helped boost Switzerland’s appeal to visitors from outside the euro zone. Since late March, the franc has lost 10 percent of its value against the dollar, fallen 14 percent against the yen, and eased nearly 8 percent against the South Korean won. Accordingly, while Swiss statistics office data show that overnight hotel stays by Europeans slipped 4.6 percent in May from a year ago, those by Asian tourists rose 8.3 percent, confirming the trend of previous months. Stays by mainland Chinese jumped 34 percent in May, those by Gulf visitors rose 22 percent and for Japanese they climbed 13 percent. Moreover, tourists from Asia and the Middle East tend to spend more than their European counterparts. As well as trinkets like cow coffee mugs, shops in towns like Interlaken or Lucerne do a roaring trade in watches from Swatch Group and Richemont, with brands such as Cartier and Tissot. While Germans and Italians spend 150 Swiss francs ($150) a day on average, visitors from the Gulf spend 500 francs a day, a study by tourism board MySwitzerland shows. Chinese average 350 francs in spending a day and Indians average 300 francs. Last year, about 30 percent of travelers to Switzerland came from the euro zone, while 8 percent came from Asia and the Middle East – a number likely to rise in the future. On this day, Chinese, Indians and Japanese greatly outnumber Europeans on the Jungfraujoch’s observation deck with sweeping views of Aletsch glacier, the longest in the Alps. A young woman clutching a South Korean flag jumps up and down in the snow, as her friends take her picture. Construction of the railway began in 1896, and workers toiled for 16 years with picks and shovels to dig behind the North Face of the Eiger, one of rock climbing’s most daunting cliffs. Work was beset by blasting accidents, strikes, and financial problems – 30 Italian workers lost their lives. The 100th anniversary will be celebrated on the Swiss national holiday, August 1, with fireworks and music. Foreign tourists spent more than 15 billion francs on travel and hotels in Switzerland last year, official data show, second only to a record set in 2008. 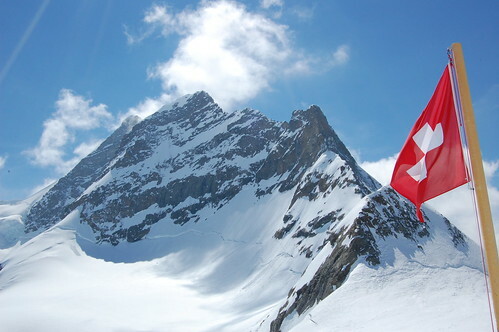 Tourism accounts for about 3 percent of annual Swiss output. “Asian business is going swimmingly,” said Simon Bickel, Jungfrau railway spokesman, adding that the Asian influx has more than compensated for a fall in European visitors due to the debt crisis. Asian tourists began arriving in larger numbers about 20 years ago, and the last decade has seen a marked rise in Indian and Chinese visitors as Asia’s economic growth accelerated, Bickel said. Visits from mainland China have increased in recent years as Beijing relaxed rules on overseas travel. A survey in April by Ctrip.com, a large online travel service provider, showed that Switzerland was the favorite European destination for Chinese travelers. The Swiss have also launched marketing campaigns abroad to attract new visitors. To boost the Jungfraujoch’s appeal, management is catering to Asian tastes: In addition to Swiss chocolate, a snack bar offers masala chai (spiced tea) for Indians, and signs in Chinese and Japanese advertise bowls of instant noodles. The peaks of the Eiger, Moench and Jungfrau mountains are decked in snow even in the summer, high season for travelers from Asia and the Middle East seeking refuge from the blazing heat or monsoon back home. For many Indians, Switzerland represents a safe alternative to the troubled mountainous region of Kashmir, at the heart of tensions between New Delhi and Islamabad, and once a popular holiday destination. Sujatha Thoota and her husband Madhav, a psychologist, are on a 14-day tour of Europe. Their next stop is Paris.